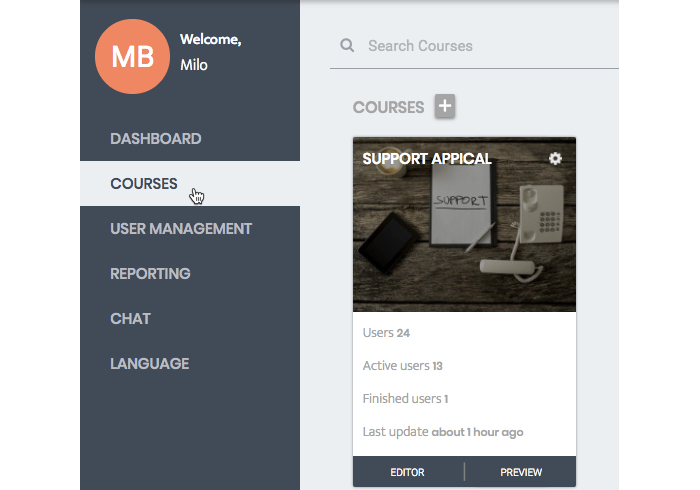 Invite new users and welcome them to the organisation in your own words! 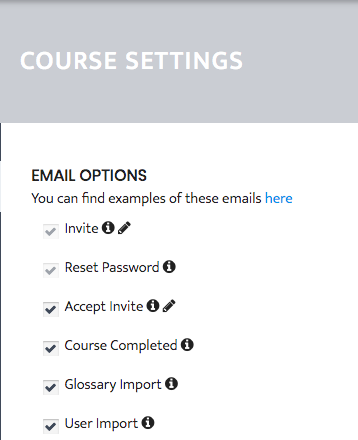 Automated e-mails are sent to users from AppicalNow to stimulate them to log in and use the app. An administrator can decide wether these emails will be sent from AppicalNow, and when. The purpose of these emails is to remind and motivate. 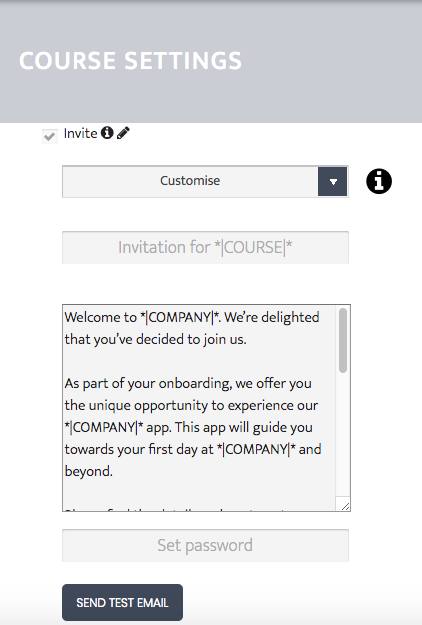 Here is how you can customize the text in the invitation & welcome emails and make them extra personal. Step 2. Click on the gear-icon in the top right corner of the course that you want to edit and select ‘Settings’. Step 3. Scroll down until your reach 'email options'. Notice the pencil icon next to the Invite and Accept Invite option. These are the emails which text you can edit. Step 4. Click on the pencil icon, and select customize. Step 5. Customize your text! We've included a default text in all the fields, you can use it or delete it if you like. Email subject field: type in the text that will show in the recipient's email subject. Email body text field: type in the invitation text according to your liking. Think about motivating users to download the app and explain how to log in. Be warm and effective, use your company's tone of voice and make your user feel welcomed! For examples and ideas, look here. Button text field: type in the few words that will be on the button on the bottom of the email. A short call to action will be best. Anything you type between *|__|* will show the specific user details as they are in the system. For examples, writing "Welcome *|FNAME|*!" to a user whose first name in the system is defined as Robin, will appear as "Welcome Robin!" in their email. Want to see the whole text at once? 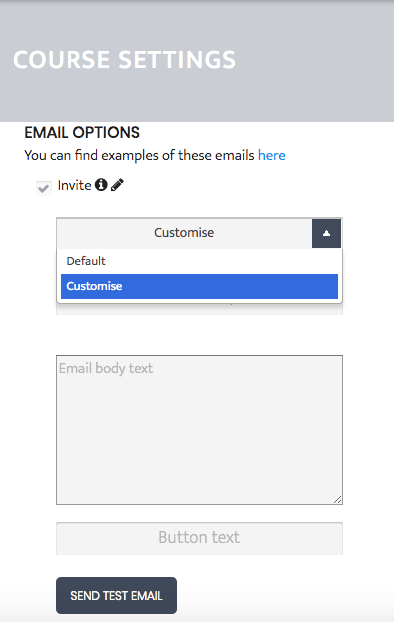 The email body text field expands! Click and hold the bottom right corner of the text field and drag it. Step 6. Send a test email. 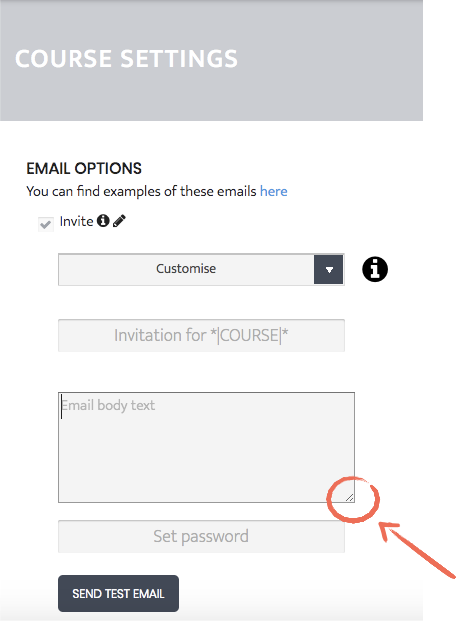 Click the Send test email button and view the email you created. This won't be sent to anyone else but you. When you are happy with your creation, scroll down and click on 'save changes'. Your customized text will now appear in the next emails you send out. Hurray! you just created a customized email!